Wood is a versatile material in interior design and is used for flooring, wall coverings, and furniture around the world. There are different types of wood that are used in home interiors, from oak to pine, each with its own set of qualities. Generally, though, all types of wood are used primarily for the qualities they have in common. Aesthetically, there are few other materials that add the same feeling to a room as you’ll find with wood. There is something about the texture of wood that, alone or paired with plants, stone, and cotton, means there’s little that beats it aesthetically. It provides us with a sense of harmony and wellbeing. Wood is warm in tone which makes a room feel welcoming. It’s also full of natural lines and patterns which are pleasing to the eye and tend to be missing from other flooring or wall covering options. It is also hard-wearing, long-lasting and hugely versatile, suiting modern and traditional styles. 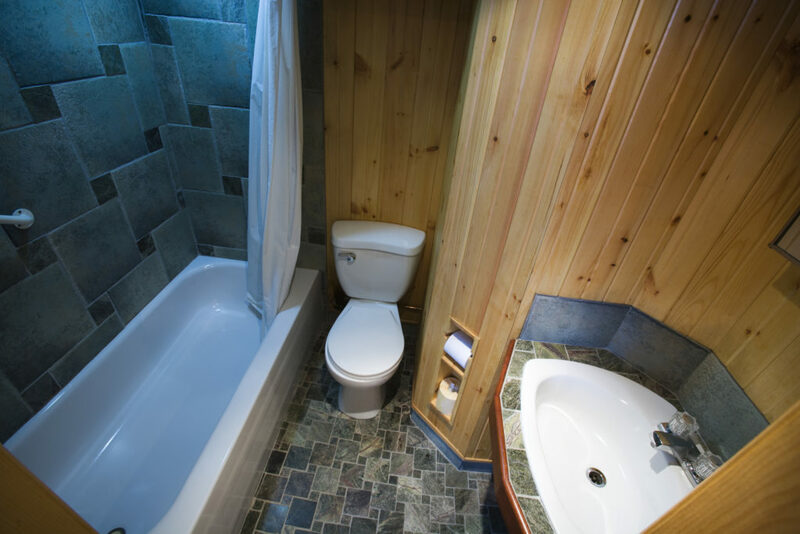 Despite wood’s popularity as a material in interior design, it has long been excluded from bathrooms because when wood gets wet, it can expand, crack, or otherwise get misshapen. None of these things are what you would want from your bathroom floors, walls, or furniture. However, there are plenty of ways you can get around this to incorporate wood into your bathroom. One of the most common ways of using wood in the home is through flooring. You can now extend this to the bathroom with waterproof wood flooring made from PVC and wood grain. Waterproof wood flooring is affordable, available in different styles and colours, and 100% waterproof meaning you don’t need to worry about your floor warping getting wet, dampness, or condensation, potentially affecting your flooring. Cladding panels are also great for sealing your bathroom if you are worried about water finding its way through the structure of your home. Bathroom wood panelling can also be used in bathrooms to create a natural aesthetic. Rather than using bare or lightly varnished wood panels, as you might elsewhere in your home, using wood effect wall cladding panels will add a luxurious wood effect to your bathroom walls. Cladding panels are water resistant and are super easy to clean. As there’s no need for grouting, using cladding means that there will be no crevices for black mould to build up in. Not only can you opt for wooden walls or flooring in your bathroom, you can also incorporate wood elements in other areas like your countertops or vanity units. Wooden bathroom cabinets, plant pots and mirror frames are all ways to subtly incorporate wood into the feel of your bathroom, without making any big changes. As long as you make sure to properly waterproof the wood in your bathroom furniture, you’ll be able to get as much natural looking furniture as you want to without the risk of water damage.